The SuperVeloce returns like the prodigal son. Highlights: Just when you thought the Lamborghini Murciélago couldn't get any bigger, badder, or more angular, comes the LP 670-4 SuperVeloce. In the vain of the Diablo SV, Lamborghini's 'exceptionally purist' LP 670-4 SV adds 30 horses to the (now) standard LP to develop 499kW and 660Nm from the stretched 6.5L V12. And all they did was tweak the valve timing and lift, and refine the air intakes. Even better, the bulging body is actually 100kg lighter, offering a 3.2sec 0-100km sprint and speed tops out at 336km/h with the heli-pad spoiler, or a greater 341km/h with a smaller rear lip. 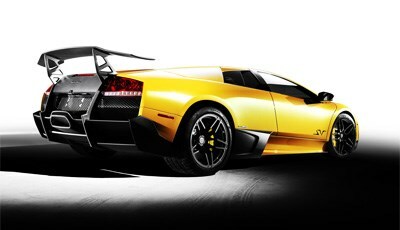 Lamborghini Murciélago LP 670-4 SuperVeloce - the new king of the bulls is even more powerful, lighter and faster. The Lamborghini Murciélago is one of the most extraordinary super sports cars of all time. Automobili Lamborghini has now expanded its model range with a new, exceptionally purist and even more extreme top model - the Murciélago LP 670-4 SuperVeloce is even more powerful, lighter and faster than the Murciélago LP 640. With the output of the 6.5 liter V12 increased to 670 hp and a weight reduction of 100 kg (220 lbs), the Murciélago LP 670-4 SuperVeloce boasts a power-to-weight ratio of 2.3 kg (5.1 lbs) per hp. This catapults it from 0 to 100 km/h (62 mph) in a breathtaking 3.2 seconds and powers it on to a top speed of around 342 km/h (212 mph). Distinctive design refinements ensure that each of this 350-unit limited edition series conveys its full potential from the very first glance. In order to achieve the substantial weight reduction of 100 kilograms (220 lbs), the Murciélago LP 670-4 SuperVeloce was extensively reworked and redeveloped in virtually every aspect - from chassis to engine and transmission, right through to the interior. The increase in engine output from 640 to 670 hp is the result of optimized valve timing and a reworked intake system. The significantly modified aerodynamics with substantially increased downforce brings considerable improvement to vehicle stability at very high speeds. With the small standard-fit rear spoiler, top speed stands at 342 km/h (212 mph), while the large "Aeropack Wing" and its added downforce gives a top speed of 337 km/h (209 mph). The Murciélago is an icon of the Lamborghini brand - a sports machine of menacing character and brutal power. Its unique design radiates a supreme form of highly concentrated sensuality. Wide, low, with its glass area pushed way forward and a long, taut back - the interplay between the soft contours of the basic form and razor sharp edges is the perfect expression of the Lamborghini design language. In the totality of its character, the Murciélago is without comparison on the sports car market. Yet even a character like this can be further refined - the new Lamborghini Murciélago LP 670-4 SuperVeloce is the more extreme, even more purist pinnacle of the model range. This is clearly evident from the very first glimpse of its completely redesigned front end - pulled way forward and finished in matt black paint, the carbon fiber front spoiler is connected to the front end via two vertical elements. The large air intakes for the front brakes are more powerfully emphasized. The new front fenders feature additional air intakes for brake ventilation. The air vent for the oil cooler located in the driver-side sill area is painted matt black to match the sills. The aerodynamics of the Murciélago LP 670-4 SuperVeloce have been completely redeveloped. Alongside the enlarged front spoiler and the twin rear diffuser, the new fixed rear spoiler also plays an important role. Customers can choose between two versions, with the small rear spoiler providing improved downforce at high speeds. As an option, the Murciélago LP 670-4 SuperVeloce can be supplied with the "Aeropack Wing" - a large, fixed, carbon-fiber wing mounted on two carbon-fiber brackets. The new aerodynamic set-up provides a significant boost to directional stability at the very highest speeds. The top-speed downforce on the Murciélago LP 670-4 SuperVeloce with Aeropack is strongly increased. With the construction of the Murciélago LP 670-4 SuperVeloce, Lamborghini proves its expertise in the manufacture of lightweight materials and in working with hi-tech carbon fiber. The structure of the super sports car is a composite construction of extremely stiff carbon components and a tubular steel frame - as in a race car. The transmission tunnel and the floor are made of carbon fiber, attached to the steel frame using rivets and high-strength adhesives. The roof and the exterior door panels are formed in sheet steel, while the remainder of the outer skin is made from carbon composite material. For the Murciélago LP 670-4 SuperVeloce, engineers in Sant'Agata Bolognese recalculated the framework and selected a new, super high-strength sectional steel. This achieved two objectives - on the one hand, they increased the torsional stiffness of the chassis by 12 percent to provide improved handling precision and, on the other, they were able to reduce weight by 20 kg (44 lbs), making a significant contribution to the reduction of overall vehicle weight. And the systematic approach to lightweight design continues throughout the entire bodyshell. The front fenders, the rear side panels/fenders and the casing for the third brake light are made of a modified carbon-fiber material. Combined with the removal of the drive for the moveable spoiler, this brings a further weight reduction of 13 kg (28.6 lbs). The longitudinally mounted 6.5 liter V12 delivers the infernal power for an unparalleled driving experience. With 670 hp (493 kW), the engine in the Murciélago LP 670-4 SuperVeloce is 30 hp more powerful than in the Murciélago LP 640. The twelve-cylinder sends its mighty 660 Nm (487 lb-ft) of torque to the crankshaft at 6,500 rpm; maximum power is reached at 8,000 rpm, with an average piston speed of 23.7 meters per second - a figure almost comparable to race engines. The V12 is eager to deliver its performance - it brings its menacing power with immediacy and precision to guarantee breathtaking performance - after only 3.2 seconds the SuperVeloce has already reached 100 km/h (62 mph). The engine block and heads of the V12, positioned at the ideal cylinder angle of 60 degrees, are made from aluminum. The four chain-driven camshafts are variably controlled, while the intake manifold operates in three stages - both technologies add even greater thrust to the merciless pushing power. To increase the performance of the SuperVeloce, the intake system was modified, the valve train optimized and, most importantly, valve travel was increased. The weight reduction of more than 26 kg (57 lbs) in the engine area was derived primarily from the completely new exhaust system. The muffler has been redesigned and even the mighty tailpipe of the SuperVeloce manufactured from new materials is lighter than on the Murciélago LP 640. But most of all, the new exhaust system makes for an acoustic experience that is surely equal to the driving performance - from the heavy rumble of a stormy night, through the trumpeting of mighty elephants to the roar of a raging lion, the SuperVeloce performs the grand opera for 12 cylinders, 48 valves and 8,000 revs. The Murciélago LP 670-4 SuperVeloce delivers its extreme power to the road with great reliability - assured by its permanent all-wheel drive. Before the rear wheels spin, the viscous coupling sends up to 35 percent of driving force via its additional shaft to the front wheels. The front and rear limited-slip differentials are set at 25 and 45 percent. With its four driven wheels and traction, the Murciélago delivers a decisive advantage over rear-wheel drive sports cars when it comes to accelerating out of a corner - and always with maximum stability. The rear axle bears 58 percent of its overall weight - a distribution ratio that is highly beneficial to traction. Explosive dynamics, tenacious cornering and extreme speeds - the Murciélago LP 670-4 SuperVeloce is a super sports car packed with aggressive power, but by no means a mean-spirited car. Its steering requires very little power support, giving full control of the car to the driver. Those prepared to tackle the beast head on are quickly rewarded with intimate contact and trust - as speed increases, so the Murciélago reveals its strengths, thus exposing a character with no hidden surprises and behavior that can always be anticipated. The Murciélago is fitted with double wishbone suspension all round. Spring struts - two on each of the rear wheels and one on each of the front - control the loads transferred from the road. The standard-fit lifting system enables the front end of the vehicle to be raised by 45 mm (1.8 inches) to avoid obstacles such as garage entryways. The SuperVeloce is equipped with exclusive "Ares" alloy-forged wheels, bearing the exclusive five twin-spoke design. The front wheels are clad in 245/35 ZR 18 rubber, while the rears sport 335/30 ZR 18. High-grip Pirelli P Zero Corsa tires come as standard. Even stepping into the Murciélago LP 670-4 SuperVeloce is an experience as individual as the vehicle itself. The upward-opening doors - a solution developed by Lamborghini in the early seventies for the Countach - are released via small latches, then swing wide open to reveal a panorama of the exclusive interior of the Murciélago LP 670-4 SuperVeloce. The dominating materials are Alcantara and carbon fiber, which make for an ambience that is as high-quality as it is sporty. But absolutely no corners have been cut when it comes to one characteristic that is a feature of all Lamborghini super sports cars - the exceptionally high quality of the workmanship. The craftsmen in Sant'Agata Bolognese are all masters of their respective trades; the three-year warranty bears testimony to absolute faith in product quality.